Compare prices from several car hire companies in Cuenca and find the best price for car rental. Our prices always include unlimited mileage and insurance. 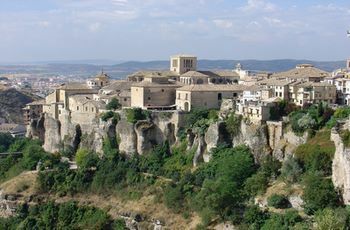 Cuenca is located on the east coast in the middle of the country, and it takes approx. 2 hours to drive to the capital Madrid in the northwest. The city has grown up at the place where the rivers Júcar and Huecar meet. In 2010, there were approx. 55 000 inhabitants in Cuenca. Cuenca is known for the historic feel of the city with its narrow streets and old buildings. A well-known building is the cathedral which was completed in 1270 and is one of the country’s first cathedral. In addition, you can visit museums such as an archaeological museum, several parks. The nearest airport is Madrid-Barajas Airport, located approximately 170 km northwest of Cuenca. This is the largest and busiest airport with flights to Moscow, Athens and Buenos Aires.